We don’t watch much television, but when we do, we enjoy Home and Garden Television’s (GHTV) number one show, House Hunters. Whelan on Walkabout wonders, “What would our House Hunters episode look like?” Let’s see. Restless Roaming Retirees, Keith and Cindy, are relocating to rainy Washington State. Narrator: Retirees Keith and Cindy have left their careers in public service and sold their home so they can travel the world. They have decided to downsize and move into an apartment in the Puget Sound area of Washington State where their son can look for a computer programmer job. She wants open floor plan and a quiet neighborhood. He wants to stay on budget and have a close walk to services. Can these restless retirees find their next comfort zone and a job for their son in the Pacific Northwest? Narrator: Restless retirees Keith and Cindy are looking to relocate to the clean and green Washington State. 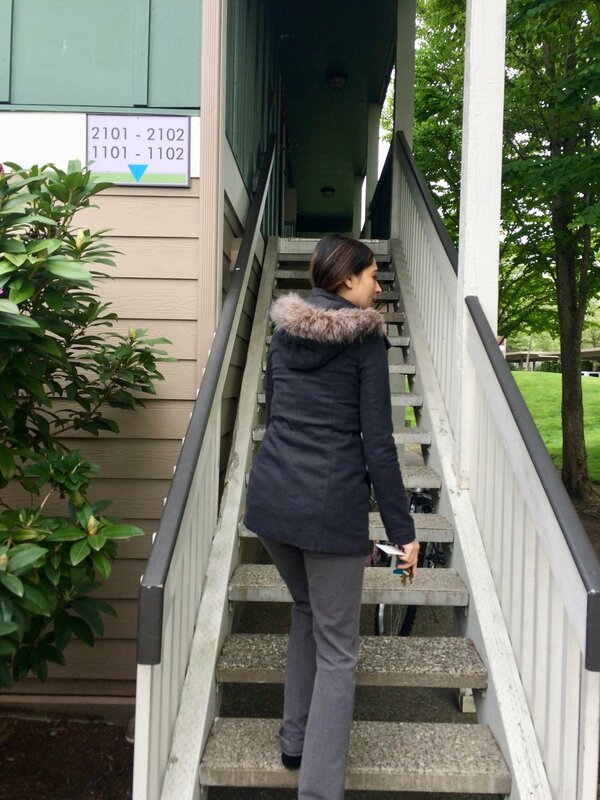 Their first apartment option was listed on Craigslist; close to family and in the center of the thriving technology industry in Redmond, Washington. But after talking to the current renter, they decided it would be better to deal directly with the Vesta Apartments rental office. Naaz needs to show them something that meets their needs and is available next month. Lake Sammamish and family are within walking distance of Vesta Apartments, Redmond, WA. Naaz for Vesta Apartments: So Keith and Cindy. I understand you are looking for an apartment. What kinds of things are you looking for in an apartment? Cindy: Well, I want a quiet location away from traffic sounds and busy roads. I like an open floor plan, and two bedrooms and two baths. We must have two bedrooms because our son, Patrick, is going to be living with us while he looks for a job in the area. Keith: The big thing for me is staying in budget. We are only going to be in the apartment until we can find a condominium to buy in this area. I like to take long walks, so I want to have coffee shops, services, trails, and places where we can walk. We also like to bike to places. Naaz shows the Whelans a nice apartment in Redmond Washington. Naaz: OK. We have a lovely renovated apartment available and empty. I think it will meet most of your needs. We can take a look at it now if you want. Are you ready to go? Cindy and Keith: You bet. We are ready. Let’s go! Narrator: The first property the Whelan’s are looking at is a two bedroom, two bath second-floor apartment. This location is close to family and ticks all their boxes but comes at a price. Naaz for Vesta Apartments: Here we are. This is the place. What do you think? Keith: Well, I was hoping for a first floor to make moving in easier, but with a second floor we don’t have neighbors dancing on our head. Cindy: Yes, we might want to get some help moving our furniture up the stairs. Naaz: Here is the first bedroom and the bathroom is across the hall. Cindy: This will work for Patrick. It is a bit dark, but it looks like it is about the same size of his current bedroom. And the bath across the hall works well for him. We don’t need to share a bathroom with our son. Keith: And the living room is a bit dark, and there is no overhead light. Naaz: And here is the kitchen. Cindy: Look Keith. They were expecting us. They have two glasses and a bottle of wine waiting. Keith: Does the apartment come with a bottle of wine? Naaz: No, you will have to bring your own bottle of wine. Cindy: Rats. I guess we can buy one for ourselves. I don’t like electric range tops, but we will never find a gas appliance in an apartment. Can you imagine a gas explosion in an apartment? Ewe. Not pretty. 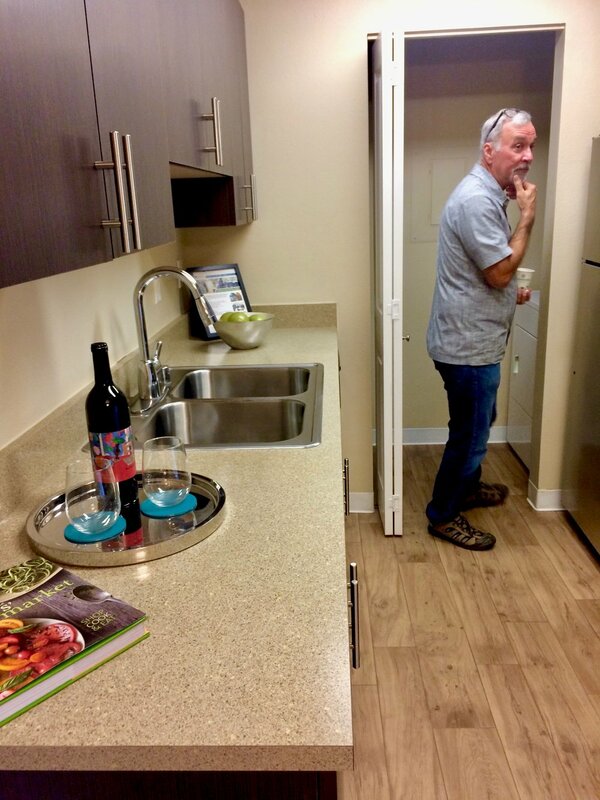 Keith: Not much counter space, but I like that it has a washer and dryer in the apartment. There is no way I would ever go back to using a coin-operated washing machine. The refrigerator is small but clean and usable. Naaz: Here is the second bedroom with two closets, and the second bathroom is en-suite. Cindy: It is tiny, and I don’t think our bedroom furniture is going to fit. But the bathroom is clean and nice enough. There is no shower curtain. Keith: We can buy a shower curtain. Keith: It is a small bedroom. But it is an apartment. We can’t afford something that is as big as our house. And besides, this small place is already at the top of our budget. We can’t afford something bigger if we are going to travel around the world. Cindy: You have a point. I do want to travel more. Narrator: This roaming pair has decided to downsize and simplify their lives so they can travel the world. Their first step was selling their house of 18 years. Now they are relocating to an apartment where their son can seek out his new career aspirations, and they can start roaming the world. Cindy: Wait, wait. This place is good enough. If we look at other properties, it is going to cost us time and money. We don’t have much of either. And I'd rather go for a hike. Keith: And it is an apartment. There aren’t many choices that look any better than this one. An apartment is an apartment. Narrator: But we need to have conflict, disagreement, friction, show choices, and compromise. You must make concessions. For the sake of format, you look at three places. We always have three properties, and you eliminate one, then you agree on where you will live, and then you kiss. Keith: But this apartment is good enough and at the top of our budget. We also need time to fill out a renter’s application, pay the application fees, have a background search, get a money order for the first month’s rent, get approved, get renters insurance, do a walkthrough, and go home and pack our things. If we spend time looking at two more properties chances are it is going to look the same. If you have seen one apartment, you have seen them all. Cindy: And I'd rather go for a hike. Narrator: OK, ok. But will you do the decision part? Keith: We can do that if it doesn’t take up too much time. Cindy: Then can we go on a hike? Narrator: The Whelan’s have seen some excellent properties for rent in Redmond, Washington. Can these restless retirees agree on their new rental retreat? They now have a big decision to make. Cindy: Yes we have to make a decision. We’ll have to talk about it some more, and we’ll have to eliminate one… (getting back on script.) We have seen some great properties in this area. Keith: Yes we have. There was the Vesta Apartment. Cindy: Yes. And I liked the Vesta Apartment. It was at the top of our budget but it had a great location near our family. Also it is within walking distance of Lake Sammamish and ready for us to move in next month. I think Patrick could look for jobs in this area. It is an apartment. What do you expect? Cindy: Let's go tell Patrick that we found a new apartment to move into next month. Keith: Yes. And we can pay our fees and get started on all the online forms we need to fill out. Cindy: First, lets go on a hike. The Whelans go for a hike in the Billy Frank Jr. Nisqually National Wildlife refuge. It was a beautiful day in Washington State. Coming Soon: The Whelan’s “Three Months Later” scene where Whelan on Walkabout declares that they made a great decision to move to Redmond. Soon they will travel the World.